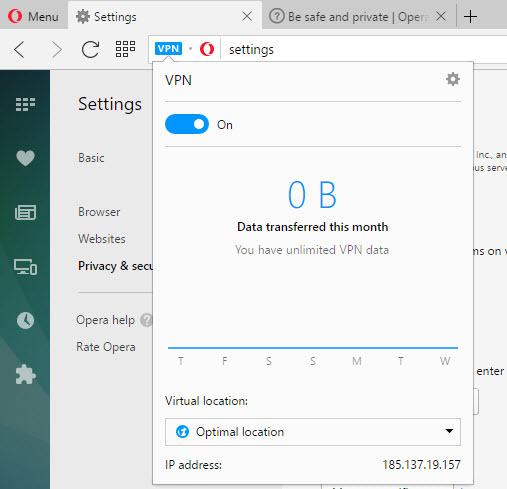 Opera is the first major browser to bring native virtual private network (VPN) feature directly to its browser. Opera VPN is a free service and it provides unlimited data transfer. 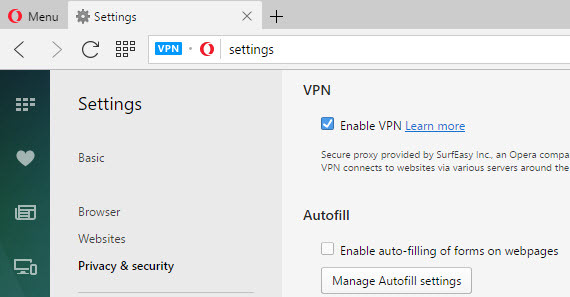 With this new VPN feature, you connect to websites via opera VPN server. The connection between your browser and the opera VPN server is encrypted. Update your opera browser to the latest version, that is opera 40 and later. Click the opera main menu button and select Settings. Then click the Privacy & security menu on sidebar. Under VPN, check the “Enable VPN” checkbox. Enable VPN option starts the VPN service automatically and the blue VPN badge appears in the combined search and address bar. 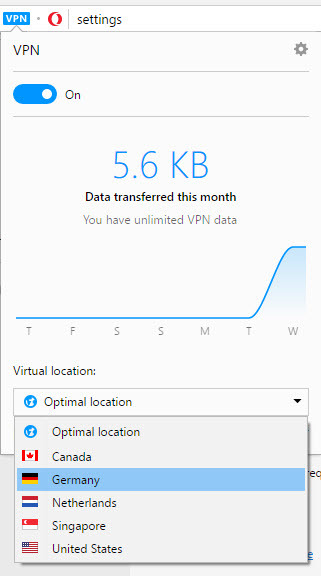 On clicking the blue VPN badge, you can see the VPN on/off option and information about data transferred and the option to change VPN virtual location. Currently there are 5 countries available. US,Canada,Singapore,germany and Netherlands. If you do not choose a country, you are automatically assigned an optimal location.